It’s no surprise that Arctic sea ice is thinning. What is new is just how long, how steadily, and how much it has declined. University of Washington researchers compiled modern and historic measurements to get a full picture of how Arctic sea ice thickness has changed. The results, published in The Cryosphere, show a thinning in the central Arctic Ocean of 65 percent between 1975 and 2012. September ice thickness, when the ice cover is at a minimum, is 85 percent thinner for the same 37-year stretch. The study helps gauge how much the climate has changed in recent decades, and helps better predict an Arctic Ocean that may soon be ice-free for parts of the year. The project is the first to combine all the available observations of Arctic sea ice thickness. 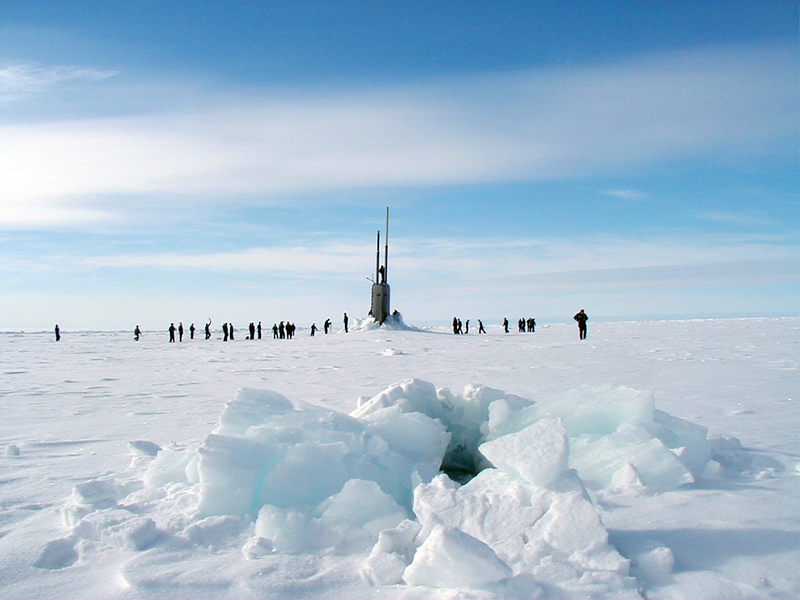 The earlier period from 1975 to 1990 relies mostly on under-ice submarines. Those records are less common since 2000, but have been replaced by a host of airborne and satellite measurements, as well as other methods for gathering data directly on or under the ice. “A number of researchers were lamenting the fact that there were many thickness observations of sea ice, but they were scattered in different databases and were in many different formats,” Lindsay said. The U.S. National Oceanic and Atmospheric Administration funded the effort to compile the various records and match them up for comparison. The data also includes the NASA IceSat satellite that operated from 2003 to 2008, IceBridge aircraft-based measurements that NASA is conducting until its next satellite launches, long-term under-ice moored observations in the Beaufort Sea from the Woods Hole Oceanographic Institution, and other measures from aircraft and instruments anchored to the seafloor. The older submarine records were unearthed for science by former UW professor Drew Rothrock, who used the U.S. Navy submarine measures of ice thickness to first establish the thinning of the ice pack through the 1990s. Vessels carried upward-looking sonar to measure the ice draft so they knew where they could safely surface. Further analysis of those records found a 36 percent reduction in the average thickness in the quarter century between 1975 and 2000. “This confirms and extends that study,” Lindsay said. The broader dataset and longer time frame show that what had looked like a leveling off in the late 1990s was only temporary. Instead, adding another 12 years of data almost doubles the amount of ice loss. The observations included in the paper all have been entered in the Unified Sea Ice Thickness Climate Data Record that now includes around 50,000 monthly measurements standardized for location and time. The archive is curated by scientists at the UW Applied Physics Laboratory and stored at the U.S. National Snow and Ice Data Center. Lindsay also is part of a UW group that produces a widely cited calculation of monthly sea-ice volume that combines weather data, sea-surface temperatures and satellite measurements of sea ice concentration to generate ice thickness maps. Critics have said those estimates of sea ice losses seemed too rapid and questioned their base in a numerical model. 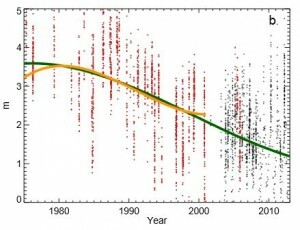 But the reality may be changing even faster than the calculations suggest. The average annual sea ice thickness, in meters, for the central Arctic Ocean. Red dots are submarine records. The green line is the long-term trend. “At least for the central Arctic basin, even our most drastic thinning estimate was slower than measured by these observations,” said co-author Axel Schweiger, a polar scientist at the UW Applied Physics Laboratory. The new study, he said, also helps confirm the methods that use physical processes to calculate the volume of ice each month. 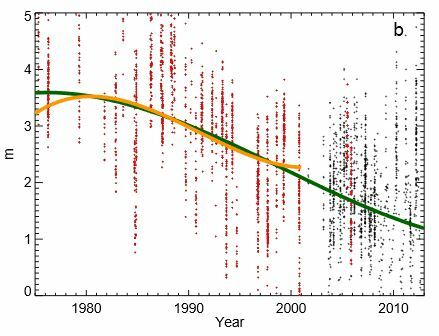 “Using all these different observations that have been collected over time, it pretty much verifies the trend that we have from the model for the past 13 years, though our estimate of thinning compared to previous decades may have been a little slow,” Schweiger said. The new paper only looks at observations up to the year 2012, when the summer sea ice level reached a record low. The two years since then have had slightly more sea ice in the Arctic Ocean, but the authors say they are not surprised. Additional funding for the project was from the National Science Foundation and NASA. For more information, contact Lindsay at rlindsay@uw.edu or Schweiger at 206-543-1312 or schweig@uw.edu.